Transnistria, officially Pridnestrovskaia Moldavskaia Respublica, PMR (short form: Pridnestrovie) is an unrecognized state in Eastern Europe. The country is recognized by three other partially or unrecognized states, Abkhazia, Nargorno-Karabakh Republic, and South Ossetia. The country declared independence from Moldova on 2 September 1990. With the help of the Russian army, it defeated the Moldovan army in the War of Transnistria. There has been peace since 1992, but the Council of Europe calls Transnistria a "frozen conflict" region. There is argument about whether it is really a country or not. The region continues to boast independence, and acts independently over its territory with the help of peacekeeping forces from foreign countries. In a vote in 17 September 2006, 97% voted to be free from Moldova. This vote has not been accepted by Moldova, which calls the territory the "Territory of the Left Bank of the Dniester". 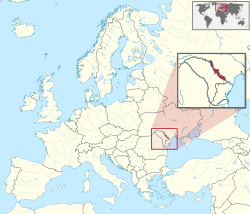 Transnistria is the only independent soviet state in the world. It still uses the hammer and sickle on its flag. ↑ "On the situation of Russian schools in Moldova". OSCE. 14 July 2011. ↑ "Law of the Moldavian Soviet Socialist Republic on the Functioning of Languages on the Territory of the Moldavian SSR". U.S. English Foundation Research. 2016. Archived from the original on 21 September 2016. ↑ "Russian language in Moldova could lose their status (Русский язык в Молдове может потерять свой статус)". KORRESPONDENT. 6 April 2013. This page was last changed on 11 March 2019, at 17:15.